​With grateful thanks to Cláudio Deveikis and Álvaro Henrique Nicolau Aguiar for their ongoing research into Carnival Glass from Brazil, and for their photographs shown in this article. There is more to see on Cláudio’s excellent website. Two different shapes and sizes in the butter dish, yet the pattern on each is most certainly the same. This is especially interesting in that the pattern is identical to the Zabkowice (Poland) design that we called Renaissance, which you can see in our Collectors Facts sheet. 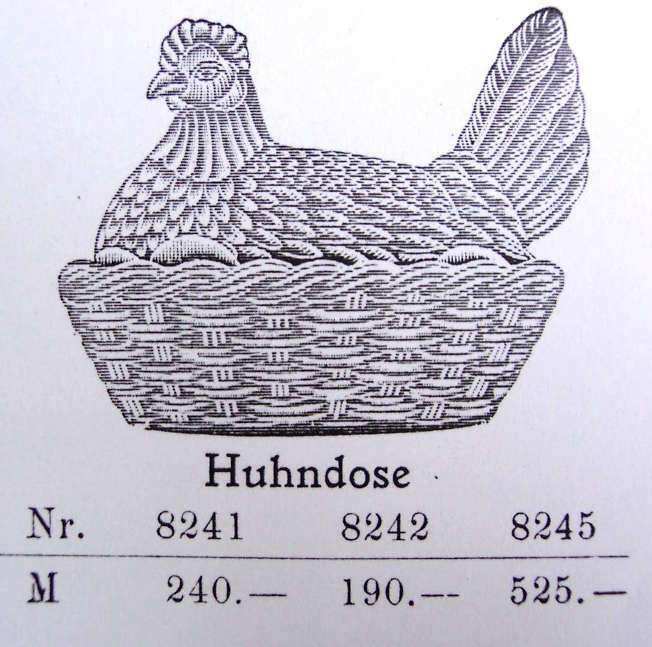 However, the butter dish in this exact pattern was illustrated in the 1905 design book of the German mould maker A. Riecke, and then again in the 1924 catalogue of the German mould maker, Kutzscher (note – Kutzscher took over Riecke in around 1905). So, did a Brazilian glass maker buy the mould from Riecke or Kutzscher and make the glass in Brazil? Or did a Brazilian glass maker copy the design for themselves? It’s also just possible that the glass was imported from Zabkowice, or just brought in by an immigrant glassworker. These two are identical to known Brockwitz Hens – it’s very probable that they were imported from Germany. Currently, none of these three butters has a confirmed pattern name or a known maker, and research continues. 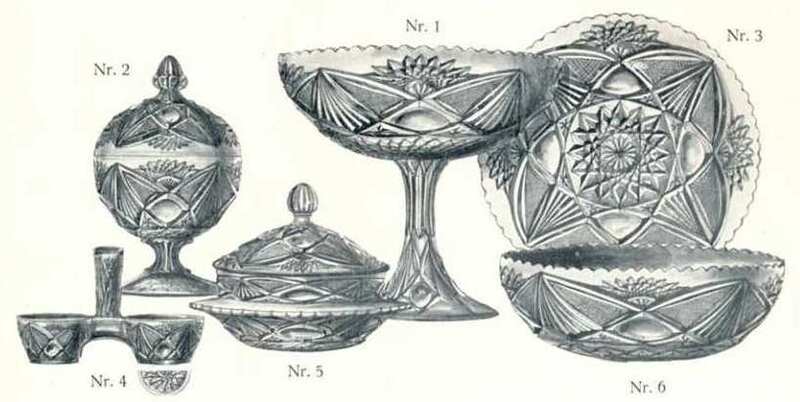 The pattern on the butter on the left could possibly have been inspired by the Marinha Grande design #132, as shown in their 1901 catalogue, below. Although it’s not a butter dish, we were so enthralled by this beautiful covered compote that Álvaro and Cláudio showed us, that we wanted to share it with you all too. 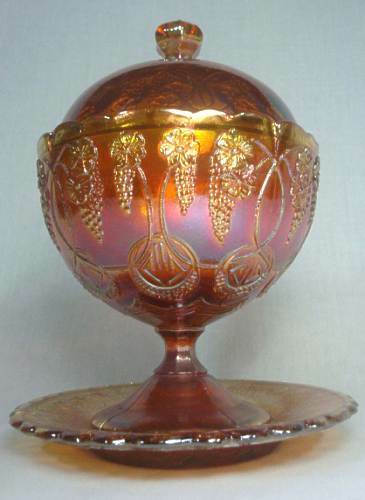 This magnificent and amazing item matches a design shown in the German mouldmaker, Kutzscher, catalogue (from 1910 - 1924). 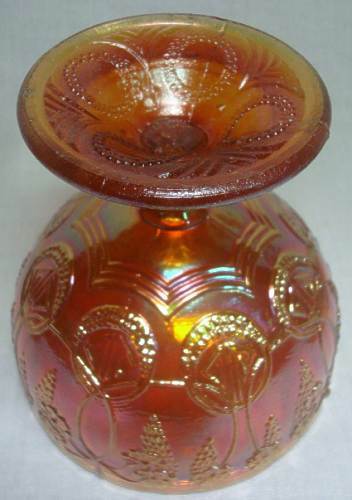 ​The exact pattern is not known to us in any European glass maker’s catalogue, but here it is, found in Brazil. 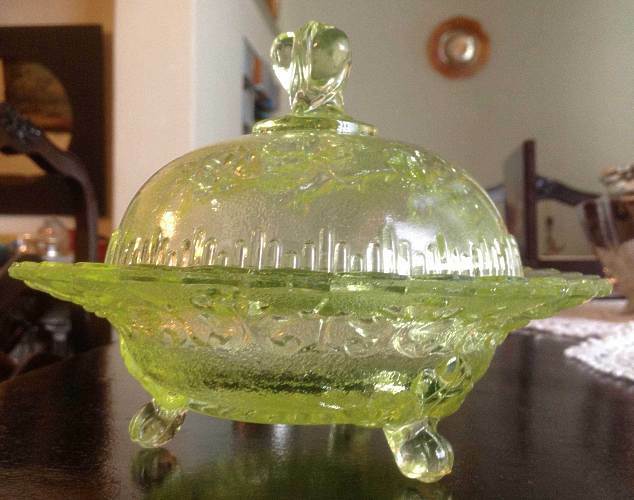 Possibly the mould was made by Kutzscher and purchased by a Brazilian glass company, such as Esberard. Whatever its story, the result is a strikingly beautiful piece of Carnival Glass. This breathtakingly lovely covered compote is shown to us by Cláudio. The set is made up of three items: the compote, lid and under-plate (presentoir). The compote itself measures just under 6 inches across, while the under-plate is approx. 8 inches across. The pattern is exquisite, the detail superb. 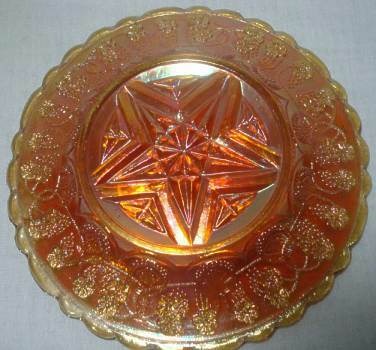 This fascinating covered piece from Brazil has been sent to us by Gustavo Genn who tells us that it has been in daily use as a cheese bowl for many years. It is vaseline with a very light iridescence, and it is marked ESBERARD RIO in moulded lettering in the centre of the base. What an amazing find – many thanks to Gustavo.